First 3M edition in 1968 with black/charcoal grey box and 3-part graphic on reverse. Identifiable by 1968 copyright date on front and back image. 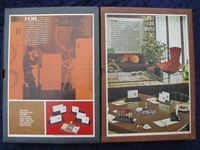 Later editions had brown boxes and included a 1969 or later copyright on the front or back.